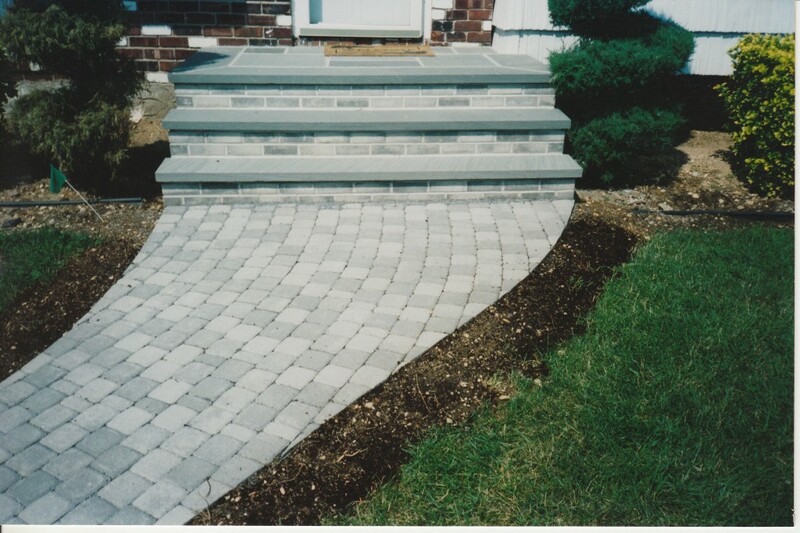 One great addition to any front or backyard paver installation is paver steps. Many people have a stoop made out of poured concrete, brick pavers, or other materials, and may want something different. This is particularly the case if the existing installation is in poor condition, or if they are replacing a walkway or patio with concrete pavers. The same concrete pavers, with the addition of coping, can be used on walkways, driveways, and patios as on the steps. This affords the homeowner many opportunities for design given the wide variety of colors, shapes, and sizes of paving stones available. In addition, there are many places besides the entrance to a home that steps can be used. Other applications include entryways for gardens, courtyards, patios, and pool decks. 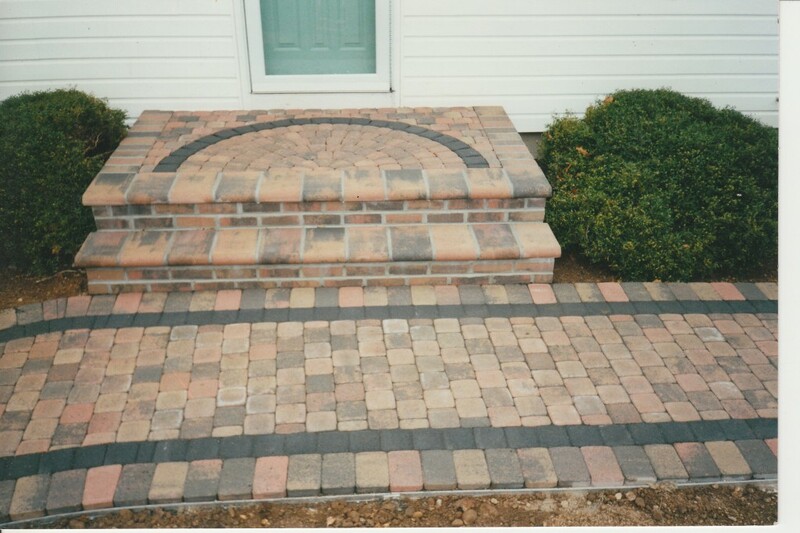 Concrete, brick, and natural stone pavers can all be used to create the paver stoop. Each has its own particular look, but all are strong and quite suitable for the job. The only major difference is price – concrete pavers are the least expensive, followed by brick and then natural stone steps. One way to get the look of expensive natural stone without having to use the entire brick is to use a stone veneer or thin tiles. These tiles will cover the surface of the stoop without being the thickness of normal pavers. Using paving stones for steps is very advantageous for many of the same reasons as for any project. Four will be highlighted here: first, pavers are slip resistant, which is important for people climbing up and down steps. Second, they are durable, and will withstand years of traffic and weather. Third, the presence of pavers so close to the home is often a unique and desirable addition, increasing the looks, function, and ultimately the value of the home. Fourth, pavers, or even thin pavers over concrete, are very beautiful and add a certain amount of class and elegance to the entrance of your home. There is one minor drawback to installing these pavers – they can be expensive. Certainly not as expensive as natural stone steps, but pavers cost will be expensive nonetheless. However, you will pay for quality if you want it – taking a look at the typical aged concrete stoop will often make you believe this very quickly! There are some aspects of pavers steps design that are unique to the particular project. When planning your project, you should clearly calculate the width, length, and height of your steps. Remember when building steps with pavers that safety is paramount, and steps should neither be too narrow nor too high. The dimensions of your steps will be important when you select the pattern of pavers that for your stoop. You will want to select a pattern that can be successfully used on the steps of the particular dimensions you’ve chosen. Some good patterns for stoops include the running bond pattern and irregular pattern. Circle kits are usually not acceptable because the area is too small. Stoops can be installed at any entrance of your home, either front, back, or side. They can be installed in concert with a patio, walkway, pool deck, or other project. Note that steps and stoops can also be constructed throughout your yard wherever there may be a significant change in elevation that a simple paver path cannot handle alone. For instance, you can build patio steps to connect your patio to another part of your yard. Note that the structure underneath does not have to be made from poured concrete – other options to exist, such as retaining wall pavers, concrete blocks, and more. Consult with a contractor to find the best available options for your project. Unlike some outdoor pavers projects, stoops are generally not great candidates for DIY paving work. They can be complicated to install, especially if a concrete foundation needs to be formed and poured first. Still, a minor stoop replacement may be doable as long as the job isn’t overly complex. The main steps of installing a new paver veneered stoop is to first grind down the concrete surface so that it flat and even. Then, new trenches must be excavated if new steps or risers are to be added to the existing structure. Here are some additional tips: first, your approach will depend on what stoop already exists. It is possible to veneer steps rather than build one from scratch. If you do decide to follow this method, make sure that the heights of the bricks won’t be different, as you’ll want to make sure that the step from the home to the stoop isn’t too high, or that the paving stones don’t stick up higher than the entrance, creating a tripping hazard! An amazing guide to installing your own paver steps can be found here. Finally, you may have to add accessories to your steps, like a hand rail, if they are very steep. When you ask someone how to build steps with pavers, also ask where you can obtain these rails. In most cases, though, you’ll want to hire a contractor to do the work for you. This is especially true if the stoop is high or contain many steps. Since people will be walking up and down these steps, you want to make sure they don’t present a tripping hazard – better to be safe than sorry. This entry was posted in Project Ideas and tagged building steps with pavers, how to build paver steps, how to build steps with pavers, paver steps, pavers steps, projects, steps and stoops by Will Grander. Bookmark the permalink.